On this date in 1884, U.S. Patents 308,421 (Apparatus for Preserving Milk) and 308,422 (Process for Preserving Milk) were issued to John Baptist Meÿenberg (1847-1914). Thus, began the evaporated milk industry. Meÿenberg had been an operator at the Anglo-Swiss milk condensery at Cham, Switzerland, which produced sweetened condensed milk. From 1866 through 1883, Meÿenberg experimented with the preservation of milk without the use of sugar. He discovered that condensed milk would last longer if heated to 120°C (248°F) in a sealed container, and hence could be preserved without adding sugar. When Anglo-Swiss declined to implement Meÿenberg’s work, he resigned from the company and emigrated to the United States. John Meÿenberg first moved to St. Louis, but soon left for Highland, Illinois, where there was a large Swiss population. Meÿenberg partnered with various local merchants, including John Wildi, Louis Latzer, Dr. Knoebel, George Roth and Fred Kaeser and, on February 14, 1885, organized the Helvetia Milk Condensing Company. The company commenced operations in a closed wool factory. Helvetia started processing 300 gallons of raw milk a day. On 8 July 1885, the steam-powered sterilizer exploded and Helvetia Milk Condensing Company closed operations for repairs. Milk canned in early 1886 spoiled. Although John Meÿenberg believed that cans were inadequately sealed, others claimed that Meÿenberg’s sterilization process was the cause. Due to this criticism, Meÿenberg left in August 1886. In 1899, Meÿenberg assisted Elbridge Amos Stuart in developing Carnation Evaporated Milk. Louis Latzer assumed the role of technical director. He determined that the spoilage was caused by bacteria and resolved the problem. John Wildi was instrumental in marketing the product nationally and internationally, especially in areas where fresh milk or refrigeration were scarce. In 1895, the company registered the Pet trademark. In 1907, John Wildi separated from the company and organized the John Wildi Evaporated Milk Company in Columbus, Ohio. During World War I, U.S. troops referred to a Helvetia milk can as a “Tin Cow”. In 1923, the Helvetia Milk Condensing was renamed the Pet Milk Company after its signature product “Our Pet Evaporated Cream”. 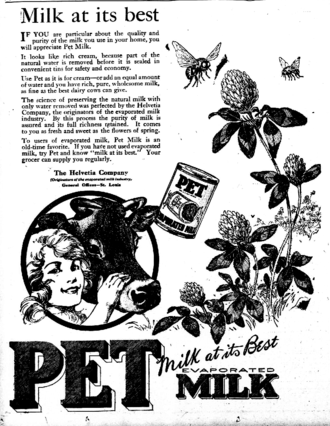 In 1929, Pet established the PET Dairy division by acquiring a fluid milk processing plant in Johnson City, Tennessee. 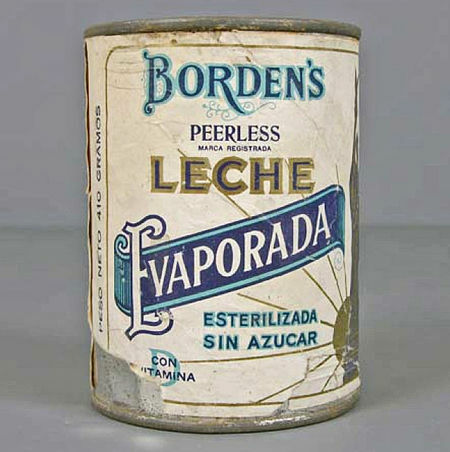 Evaporated milk must be distinguished from sweetened condensed milk and the two cannot be used interchangeably in recipes. You can think of evaporated milk as regular milk with about 50% to 60% of the water removed. It is slightly caramelized because of the processing, so does not have quite the same taste as regular milk, and is also slightly sweeter because of the evaporation. Otherwise you can use it in recipes that call for milk, but with the quantities adjusted. Sweetened condensed milk has sugar added (an anti-bacterial), which radically changes the flavor. It is also thicker than evaporated milk. 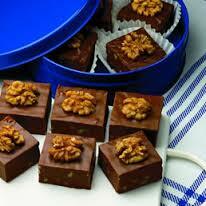 Of course, Carnation, has a website with a ton of recipes. Go here: http://www.carnationmilk.ca/recipes.aspx This one, for chocolate fudge, appeals to me although I don’t have much of a sweet tooth, and tend to prefer darker, bitterer chocolate. http://www.carnationmilk.ca/recipe-details.aspx?rid=938 There’s a handy-dandy video along with the recipe if you need it.